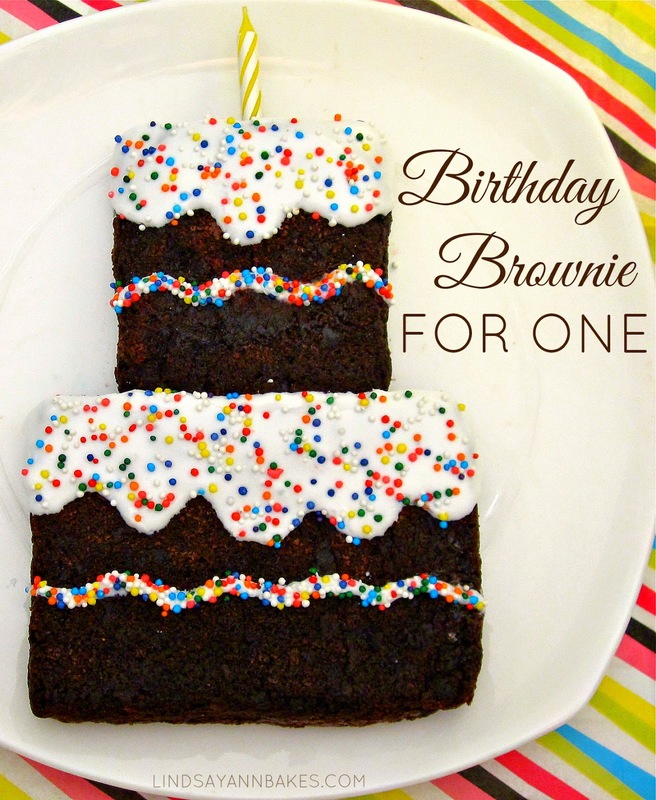 How cute is this adorable little birthday brownie?! And it couldn't be easier to make! This single-serving brownie is baked in a little loaf pan, cut in two and decorated into a little birthday cake, perfect for gift giving! It comes together right in one pot, and you get the most fudgy, moist, chocolate brownie all ready for decorating. Who wouldn't love receiving this personal portioned little brownie cake to enjoy all to themselves on their special day?! (To make a chocolate glaze: add 1/4-1/2 cup unsweetened cocoa powder, depending on level of chocolate desired, more liquid will be necessary to reach a pourable consistency). Preheat the oven to 350 degrees F. Line an 8x4 inch loaf pan with foil or parchment paper and spray with non-stick spray. Melt butter in a saucepan over medium heat. Reduce heat to low and add the sugars, chocolate, and cocoa, stirring with a wooden spoon until smooth. Remove from heat and stir for about a minute to cool mixture. Mix in the vanilla extract and egg. Stir vigorously for about 1-2 minutes until batter becomes thick, smooth and shiny. Stir in the flour, baking powder and salt, until just incorporated. Pour batter into prepared pan. Bake for about 35-45 minutes. An inserted toothpick will come out with moist crumbs sticking to it. Do not over bake. Cool brownies completely in the pan on a cooling rack before cutting. Cut brownie about 1/3 the way in, to create a square and a rectangle shape. Stack the square above the rectangle to create the birthday cake shape. For the icing, stir together all ingredients in a small bowl, adding liquid very slowly until desired consistency is reached. If glaze starts to thicken you can microwave it for a few seconds to thin it out again. Pour icing over brownie and spread it around into make the "frosting" shape. Decorate with sprinkles as desired.